When you need to feel secure, there's nothing that can replace being able to see an area for yourself. Whether you want to keep your children safe from a nanny you don't yet fully know, or you're looking for different options to lower your chances of being the victim of theft, we provide industry-trusted security and Nanny Cams that are perfect for both residential and commercial properties. Reports of nannies who physical abuse children or are negligent. Let people alert you if he or she isn’t taking proper care of your children. Resource for finding a suitable nanny. The International Nanny Association (INA), a nonprofit organization, serves as the umbrella organization for the in-home child care industry. 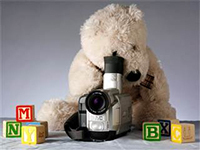 Founded in 1996, Know Your Nanny is part of Nanny Watch Services, Inc. We provide Wi-Fi live streaming nanny cams, night vision nanny cams, self recordingnanny cams, battery operated nanny cams and other nanny cams as well as cameras for warehouse, office and outdoor surveillance. Know Your Nanny has been featured on several popular shows, including The View, FOX NEWS and the CBS Early Show.